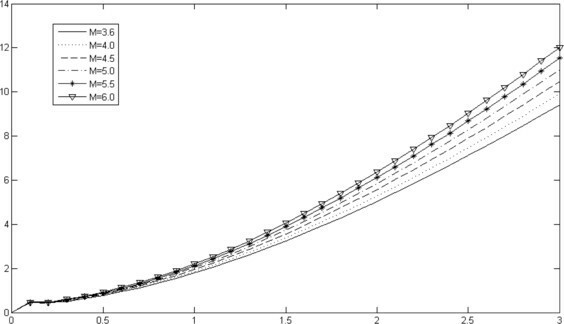 The magnetohydrodynamic stability criterion of self-gravitating streaming fluid cylinder under the combined effect of self-gravitating, magnetic, and capillary forces has been derived. The results are discussed analytically and some data are verified numerically for different parameters of the problem. The magnetic and capillary forces are stabilizing, but the streaming is destabilizing while the self-gravitating is stabilizing or destabilizing according to restrictions. The stable and unstable domains are identified and, moreover, the influences of the magnetic and capillary forces on the self-gravitating instability of the model have been examined. Including the magnetic force together with self-gravitating force improves the instability of the model. However, the self-gravitating instability will never be suppressed whatever the effects of the MHD force stabilizing effects are. The stability of a fluid cylinder under the action of the capillary or/and other forces has received the attention of several researchers (Rayleigh , Yuen , Nayfeh and Hassan  and Kakutani et al. . The effect of the electromagnetic Lorentz force on the capillary instability has been examined in several texts by the Nobel prize winner (1986) Chandrasekhar . This has been done only for small axisymmetric perturbation and with a constant magnetic field. Radwan et al. [6–10] extended such interesting works by studying the magnetohydrodynamic stability of a liquid jet embedded into a tenuous medium for all axisymmetric and non-axisymmetric modes of perturbation. 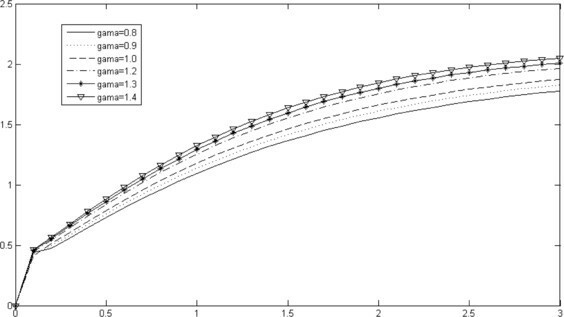 The stability of different cylindrical models under the action of self-gravitating force in addition to other forces has been elaborated by Radwan and Hasan  and . They  studied the gravitational stability of a fluid cylinder under transverse time-dependent electric field for axisymmetric perturbations. 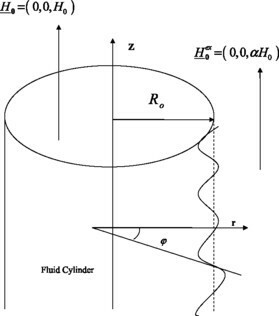 Hasan  discussed the stability of oscillating streaming fluid cylinder subject to the combined effect of the capillary, self-gravitating, and electrodynamic forces for all axisymmetric and non-axisymmetric perturbation modes. He  studied the instability of a full fluid cylinder surrounded by self-gravitating tenuous medium pervaded by transverse varying electric field under the combined effect of the capillary, self-gravitating, and electric forces for all modes of perturbations. In  Hasan et al. investigated the hydromagntic stability of a self-gravitational oscillating streaming fluid jet pervaded by azimuthal varying magnetic field for all axisymmetric and non-axisymmetric modes of perturbation. He  discussed the stability of oscillating streaming self-gravitating dielectric incompressible fluid cylinder surrounded by tenuous medium of negligible motion pervaded by transverse varying electric field for all modes of perturbations. He  studied the magnetodynamic stability of a fluid jet pervaded by a transverse varying magnetic field while its surrounding tenuous medium is penetrated by uniform magnetic field. 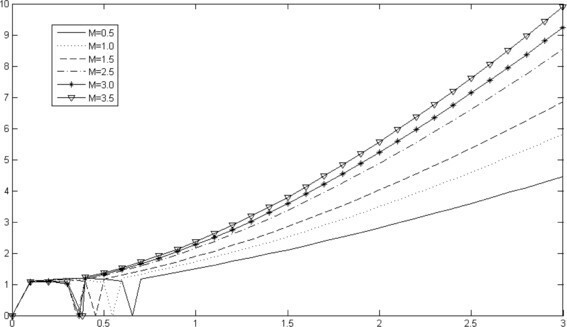 The present work is devoted to studying the magnetogravitodynamic stability of a streaming fluid cylinder and examining the influence of capillary and magnetic forces on the self-gravitating instability of the present models. This may be carried out, for all axisymmetric and non-axisymmetric modes of perturbation, analytically and the results will be verified numerically. H ̲ 0 = ( 0 , 0 , H 0 ) , H ̲ 0 e x = ( 0 , 0 , α H 0 ) . Here W and U are (constants) the speed of the fluid, H 0 is the intensity of the magnetic field in the fluid, and α is some parameter. The components of u 0 , H 0 , H 0 e x are considered along the cylindrical coordinates ( r , φ , z ) with the z-axis coinciding with the axis of the cylinder as shown in Figure 1. The fluid matter of the cylinder is acted upon by the combined effects of the self-gravitating, inertial, capillary, and magnetic forces. The surrounding tenuous medium of the fluid cylinder is acted upon by the self-gravitating and magnetic forces only. Sketch for a gravitational MHD fluid cylinder. The required basic equations for such kind of study may be obtained by combining the ordinary hydrodynamic equations and those of Maxwell’s concerning the electromagnetic field theory together with Newtonian gravitational field equations. For the problem at hand, under the present circumstances, these equations are the following. is the boundary surface equation at time t, while N ̲ s is a unit outward vector normal to the surface, T is surface tension, and P s is pressure due to curvature. Here ρ, u 0 , and P are the fluid mass density, velocity vector, and kinetic pressure, respectively; H 0 , H 0 e x are the magnetic field intensities and V, V e x are self-gravitating potentials, respectively, inside and outside the fluid cylinder, μ is the magnetic field permeability coefficient and G is the gravitational constant. from which, taking into account equation (5), we obtain ∇ ( ρ V 0 − P 0 − ( μ 8 π ) H 0 2 ) = 0 .
where C is a constant of integration to be determined. P 0 s = T / R 0 . P 0 = ( T R 0 ) + π G ρ 2 ( R 0 2 − r 2 ) + ( μ 8 π ) H 0 2 ( α 2 − 1 ) . R 1 = exp ( i ( k z + m φ ) ) . where ε 0 (=ε at t = 0 ) is the initial amplitude and σ is the temporal amplification. If σ ( = i ω , i = − 1 ) is imaginary, then ω / 2 π is the oscillation frequency of the propagating wave in the fluid. Q ( r , φ , z , t ) = Q 0 ( r ) + Q 1 ( r , φ , z , t ) . Here Q stands for P, u, V, V e x , H, H e x , and N s while Q 0 indicates the unperturbed quantity and Q 1 is a small increment of Q due to disturbances. Q 1 ( r , φ , z ; t ) = ε 0 q 1 ( r ) exp ( σ t + i ( k z + m φ ) ) . Here I m ( k r ) and K m ( k r ) are the modified Bessel functions of the first and second kind of order m, while A and B are constants of integration to be determined. Π 1 = ( P 1 ρ ) − V 1 + ( μ / 4 π ρ ) ( H ̲ 0 ⋅ H ̲ 1 ) . H ̲ 1 = ( i k H 0 σ + i m W + i k U ) u 1 ̲ . is the Alfven wave frequency defined in terms of H 0 . ∇ 2 Π 1 = 0 .
where C 4 is a constant of integration to be determined. where x ( = k R 0 ) is the dimensionless longitudinal wavenumber. H 1 e x = ∇ ψ 1 e x . ∇ 2 ψ 1 e x = 0 .
where C 5 is a constant of integration to be determined upon applying boundary conditions. The solution of the basic equations (3)-(13) in the unperturbed state given by (23)-(25) together with (1), (2) and (6) and in the perturbed state given by (43)-(55) must satisfy appropriate boundary conditions. These boundary conditions must be applied across the perturbed interface (28) at the unperturbed boundary surface r = R 0 . Under the present circumstances, these boundary conditions may be stated as follows. where x ( = k R 0 ) is the dimensionless longitudinal wave number. u ̲ 1 r = ∂ R 1 ∂ t + U ∂ R 1 ∂ z + W ∂ R 1 ∂ φ . C 4 = ( − ( σ + i m W + i k U ) 2 + Ω A 2 ) ( R 0 / x I m ′ ( x ) ) . H ̲ 1 r − H ̲ 1 r e x = i k R 1 H 0 ( 1 − α ) . C 5 = i α H 0 K m ′ ( x ) . Here we apply a compatibility condition known as the compatibility dynamical condition. The normal component of the velocity vector u must be compatible with the velocity of the particles of the boundary surface (24) at the unperturbed surface r = R 0 . P 1 + R 1 ∂ P 0 ∂ r + μ 4 π ( H ̲ 0 ⋅ H ̲ 1 ) − μ 4 π ( H ̲ 0 ⋅ H ̲ 1 ) e x = P 1 s .
ρ ( Π 1 + V 1 ) = P 1 s + μ 4 π ( H ̲ 0 ⋅ H ̲ 1 ) e x − R 1 ∂ P 0 ∂ r .
( σ + i m W + i k U ) 2 = 4 π G ρ x I m ′ ( x ) I m ( x ) [ I m ( x ) K m ( x ) − 1 2 ] + T ρ R 0 3 ( 1 − m 2 − x 2 ) x I m ′ ( x ) I m ( x ) + μ H 0 2 ( 4 π ρ R 0 2 ) [ − x 2 + α 2 x 2 I m ′ ( x ) K m ( x ) I m ( x ) K m ′ ( x ) ] . 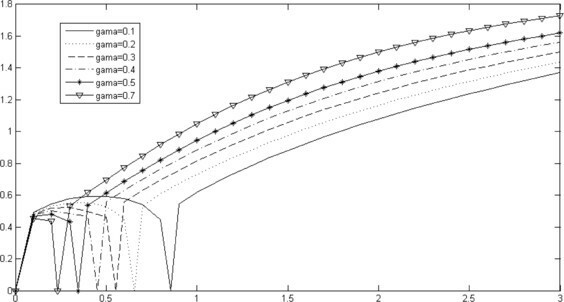 The relation (69) is the desired stability criterion of a streaming fluid cylinder under the combined effects of the capillary, inertia, self-gravitating, and magnetic forces. It is a linear combination of the dispersion relations of a streaming fluid cylinder under the influence of the self-gravitating force only, fluid cylinder under the effects of the capillary force only and the one under the electromagnetic force only. ( T = 0 , G ≠ 0 , H 0 ≠ 0 ) , ( T ≠ 0 , G = 0 , H 0 ≠ 0 ) and ( T ≠ 0 , G ≠ 0 , H 0 = 0 ) . The relation (69) relates the temporal amplification σ with the longitudinal wave number x; the modified Bessel functions I m ( x ) and K m ( x ) of the first and second kind of order m and with their derivatives, the magnetic field parameter α, the self-gravitating constant G, the basic magnetic field intensity H 0 , the fluid density ρ, the radius R 0 of the cylinder and with the coefficient μ of the magnetic permeability. Since the stability criterion (69) is a general relation, we may obtain several published works as limiting cases from it. which is the same dispersion relation as that derived by Chandrasekhar and Fermi . In fact, the authors  used a totally different method compared to the one used here. They used the method of representing solenoidal vectors in terms of poloidal and toroidal quantities. σ 2 = T ρ R 0 3 x I 1 ( x ) I 0 ( x ) ( 1 − x 2 ) . This relation coincides with that derived regarding the capillary instability of a full liquid jet in a vacuum by Rayleigh . for m = 0 . The relation (73) was established by Chandrasekhar  for axisymmetric disturbances. ( σ + i m W + i k U ) 2 = T ρ R 0 3 x I 1 ( x ) I 0 ( x ) ( 1 − m 2 − x 2 ) . the analytical and numerical discussions of the relation (76) reveal the following results. In the computer for different values of M and different cases of U ∗ and W ∗ . In the most important sausage mode m = 0 . M = [ T ( 4 π G ρ 2 R 0 3 ) ] , U ∗ = [ − i k U ( 4 π G ρ ) 1 / 2 ] , W ∗ = [ − i m W ( 4 π G ρ ) 1 / 2 ] . The numerical data associated with σ / ( 4 π G ρ ) 1 2 correspond to the unstable states, while those associated with ω / ( 4 π G ρ ) 1 2 correspond to the stable domains. It has been found that there are many features of interest in this numerical analysis as we see in the following. For M = 0.5 , 1.0 , 1.5 , 2.5 , 3.0 , 3.5 , see Figure 2. Stable and unstable domains for γ = 0 , U ∗ = W ∗ = 0.2 .
where the equalities correspond to the marginal stability states. For M = 0.5 , 1.0 , 1.5 , 2.5 , 3.0 , 3.5 , see Figure 3. Stable and unstable domains for γ = 0 , U ∗ = W ∗ = 0.5 . For M = 3.6 , 4.0 , 4.5 , 5.0 , 5.5 , 6.0 , see Figure 4. Stable domains for γ = 0 , U ∗ = W ∗ = 0.2 . Corresponding to U ∗ = W ∗ = 0.2 . It has been found that stable domains are 0 ≤ x < ∞ . For M = 3.6 , 4.0 , 4.5 , 5.0 , 5.5 , 6.0 , see Figure 5. Stable domains for γ = 0 , U ∗ = W ∗ = 0.5 . Corresponding to U ∗ = W ∗ = 0.5 . It has been found that stable domains are 0 ≤ x < ∞ . We conclude that the streaming full fluid cylinder has stable and unstable domain for M less than 3.5 and stable domain only for M greater than this value whatever the values of velocities are. Increasing the value of M, the unstable domain is decreasing. The effect of changing velocities cases on the capillarity effect is such small that it may be considered as no effect. ( σ + i m W + i k U ) 2 = 4 π G ρ x I m ′ ( x ) I m ( x ) [ I m ( x ) K m ( x ) − 1 2 ] . the analytical and numerical discussion of the relation (79) reveal the following. For U = 0 , W = 0 , it has been found that the model is gravitationally unstable in the domain ( 0 < x < 1.0667 for m = 0 mode) while it is stable in the domains ( 1.0667 ≤ x ≤ ∞ for m = 0 mode) and ( 0 ≤ x ≤ ∞ for m ≥ 1 modes). For U ≠ 0 , W ≠ 0 , it has been found that the axial flow has a strong destabilizing influence. That effect does not rely on the kind of perturbation and it is so for all short and long wavelengths. Therefore, the streaming has the effect of increasing the axisymmetric stable domain 1.0667 ≤ x ≤ ∞ and the non-axisymmetric domains 0 < x < ∞ . 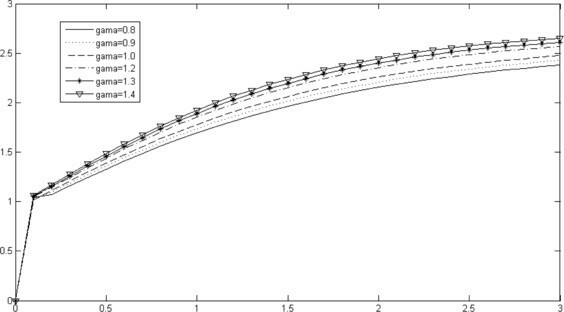 We conclude that the streaming self-gravitating fluid cylinder is unstable not only for the axisymmetric mode m = 0 , but also for non-axisymmetric modes m ≥ 1 . 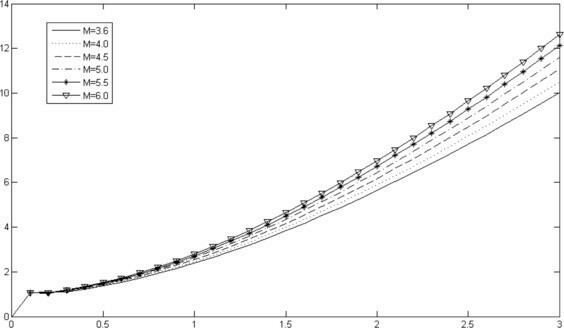 For γ = 0.1 , 0.2 , 0.3 , 0.4 , 0.5 , 0.7 , see Figure 6. Stable and unstable domains for M = 0 , U ∗ = W ∗ = 0.2 . For γ = 0.1 , 0.2 , 0.3 , 0.4 , 0.5 , 0.7 , see Figure 7. Stable and unstable domains for M = 0 , U ∗ = W ∗ = 0.5 . For γ = 0.8 , 0.9 , 1.0 , 1.2 , 1.3 , 1.4 , see Figure 8. Stable domains for M = 0 , U ∗ = W ∗ = 0.2 . For γ = 0.8 , 0.9 , 1.0 , 1.2 , 1.3 , 1.4 , see Figure 9. Stable domains for M = 0 , U ∗ = W ∗ = 0.5 . We conclude that the streaming full fluid cylinder has stable and unstable domain for γ less than 0.8 and stable domain only. Increasing the value of magnetic field, the unstable domains are decreasing. The effect of changing velocities cases on magnetic effect is such small that it may be considered asno effect. If we compare these results with those of chapter two (only velocity in z direction), we observe that the existance of another velocity W in φ direction decreases the unstable domain. For M = 0.5 , 1.0 , 1.5 , 2.5 , 3.0 , 3.5 , see Figure 10. Stable and unstable domains for γ = 0.5 , U ∗ = W ∗ = 0.2 . For M = 0.5 , 1.0 , 1.5 , 2.5 , 3.0 , 3.5 , see Figure 11. Stable and unstable domains for γ = 0.5 , U ∗ = W ∗ = 0.5 . For M = 0.5 , 1.0 , 1.5 , 2.5 , 3.0 , 3.5 , see Figure 12. Stable domains for γ = 0.5 , U ∗ = W ∗ = 0.2 . 0 ≤ x < ∞ . For M = 0.5 , 1.0 , 1.5 , 2.5 , 3.0 , 3.5 , see Figure 13. Stable domains for γ = 0.5 , U ∗ = W ∗ = 0.5 . We conclude that the streaming full fluid cylinder has stable and unstable domains for M less than 3.5 and stable domain only for M greater than this value whatever the values of velocities are. The effect of changing velocities cases on capillarity effect is such small that it may be considered as no effect. Increasing M with constant magnetic field increases the unstable domain. The velocity has a strong destabilizing influence on the self-gravitating instability of the model. The capillary force has a strong stabilizing influence on the self-gravitating instability of the model. The capillary and self-gravitating modified a lot the instability of the model for all short and long wavelengths. The magnetic force has a strong stabilizing influence on the self-gravitating instability of the model. The self-gravitating instability character has disappeared and has been dispersed, and the model has become completely stable. The velocities in two directions have a strong destabilizing influence on the self-gravitating instability of the model. 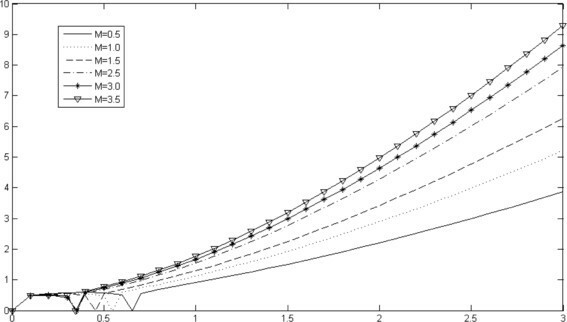 The magnetic force has a strong stabilizing influence on the self-gravitating capillary instability of the model. We are grateful to the editor of the journal and the reviewers for their suggestion and comments of this paper.